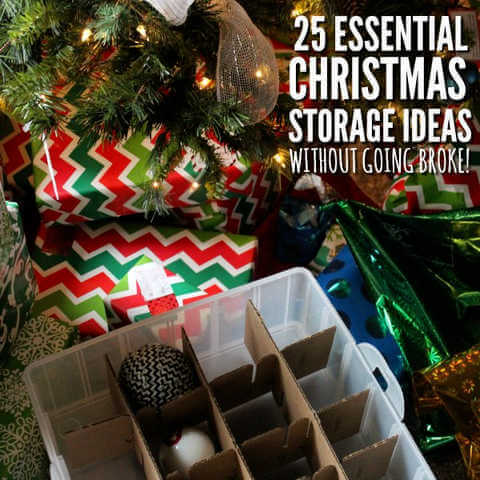 We have 25 Christmas Decoration Storage Ideas to help keep everything organized. Learn how to organize Christmas decorations with these simple and easy ideas. I can’t believe Christmas is almost here! It comes and goes so quickly. Last year I finally decided to invest in some good Christmas storage to help with storing and organizing Christmas decorations. It was the best investment! Today I wanted to share with you some easy Christmas storage ideas that will help you organize Christmas decorations this year (without spending a fortune!). Let’s get started with these Christmas Decoration Storage Ideas! 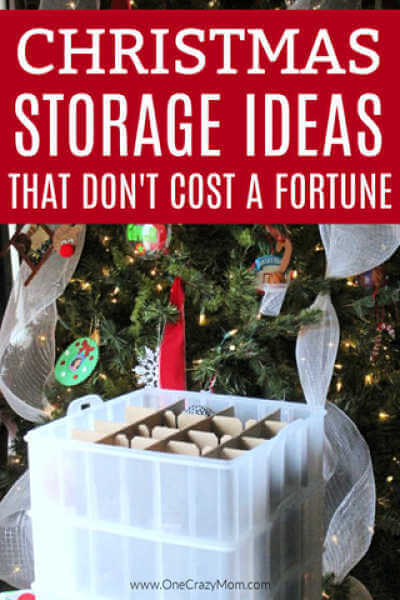 From Christmas ornament storage ideas to Christmas tree storage ideas and Christmas light storage ideas, there are lots of ideas for all your storage needs. You are going to love how simple these ideas are and how streamlined your Christmas decorations will be. These storage solutions are so easy and will take the stress out of sorting all those decorations. Remember prices on Amazon change quickly so snag yours before the price goes back up. These are the best ways to pack Christmas ornaments and other decorations! nag a few of these each year and before you know it all of your Christmas decorations will be beautifully organized and stored safely. From Christmas ornament storage to Christmas tree storage ideas, there are lots of options. Give these decoration storage ideas a try for storing your holiday decor. These storage solutions will keep your Christmas tree and other holiday decorations intact for the next holiday season. Start with one storage idea and just keep going until all your holiday decorations are organized. These Christmas decoration storage ideas will help keep lights tangle free and wrapping paper and gift wrap in good shape. Save your water bottles and use them to keep light strands from getting tangled. We also like to use plastic cups stacked in storage boxes for ornament dividers. We have one of the plastic storage bags for our artificial tree and it is so handy. Think outside the box and use what you have. 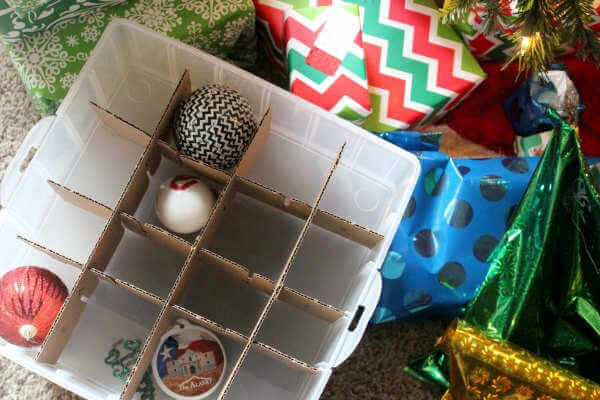 Lots of items can be used for storage boxes and even egg cartons can be used to keep fragile ornaments safely tucked away until next season. You can always add a little tissue paper or paper towels. You will be surprised how little time it takes to organize your decorations. This is so easy and frugal that you will wonder why you didn’t do it sooner. Storing Christmas decorations in the garage can be simple and easy with these tips! My favorite organization tool for Christmas decorations is definitely number one on this list – the Christmas ornaments storage, but all of these Christmas storage ideas are great. Which Christmas decoration storage containers do you like the best? There are so many options to get your decorations in order. No more worries about broken or lost items. 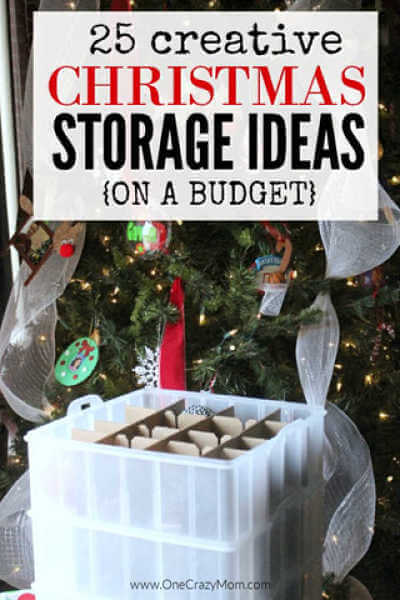 These ideas will keep everything neatly store until next Christmas. You will probably save money as well because you won’t lose any items. I can’t tell you the years we have had to buy certain decorations because I could not remember where I put them the previous year. Now, everything is neatly stored, labeled and organized for next year!